As a result of the Montreal Protocol and Kyoto Protocol and subsequent amendments and ratification by individual countries, there are current and proposed regulations limiting the production, consumption, and trade of chlorofluorocarbons (CFCs), hydrochlorofluorocarbons (HCFCs), and hydrofluorocarbons (HFCs). 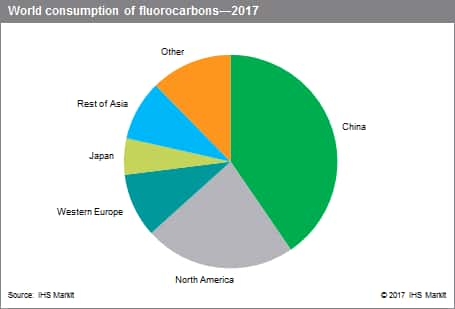 Since the mid-1970s, the global fluorocarbons market has undergone a number of major transitions toward greater use of non-ozone-depleting HFCs and non-global-warming fluorocarbons (hydrofluoroolefins [HFOs]) and nonfluorocarbon alternatives in emissive applications. The refrigeration and air-conditioning market is undergoing a shift to greater use of HFC products, especially those with low global warming potentials, fluorocarbon blends, and nonfluorocarbon alternatives (such as hydrocarbons in Europe and Japan); an overall reduction in leakage; and the capture and reuse of refrigerants during equipment servicing and disposal. The refrigeration and air-conditioning segment has many alternatives with both fluorocarbons (including HCFCs, HFCs and HFOs) and nonfluorocarbon alternatives. HFCs, which replace CFCs and HCFCs, do not contain chlorine and/or bromine and do not deplete the ozone layer. However, they, along with CFCs and HCFCs, are considered greenhouse gases. The extent to which some HFC fluorocarbons, particularly HFC-134a, contribute to climatic change or global warming has become the subject of significant environmental concern, particularly in Europe, and raises questions on the continued use of these ODP-free CFC-replacement chemicals. Non-fluorocarbon-based products, such as hydrocarbons, have been introduced and are now the established standard in Europe and Japan for automobiles and home refrigeration, respectively, replacing HFC-134a. Adoption of the Kigali Amendment will accelerate innovation and technology development for climate-friendly refrigeration technologies, which will result in a HFC phasedown of 40% in the developed countries by 2024 and doubledigit growth for HFOs over the next five years. Developing countries have completed the transition from CFC-12 to HCFC-22 and many have shifted further to HFC-134a; during the forecast period, some of these countries may leapfrog directly from HCFC-22 to HFO-1234yf in mobile air-conditioning. From 2017 to 2022, global consumption is expected to increase at an average annual rate of 3%. Growth in developed countries will be minimal; North American consumption will increase at only 0.2%, European consumption is expected to grow at about 1.2% per year, and Japanese consumption will decline at 0.1% per year. Chinese consumption of HCFCs in the major sectors—refrigeration and air-conditioning and PU and XPS foam blowing solvents—is expected to decline significantly during next five years, while precursor consumption will increase at more than 8% per year, for overall growth of about 5% per year. The Chinese market for HFCs is expected to grow at 7.7% per year.